Could HD Cameras On Space Station Help Save Planet Earth? The two commercial Earth-observation cameras installed on the International Space Station Monday (Jan. 27) could help foster a greater conservation ethic across the planet, the instruments' owners say. Vancouver-based Urthecast aims to make money using the high-definition cameras, which two Russian cosmonauts attached to the orbiting lab's exterior during a Monday spacewalk. But company officials think the project could also motivate people to take better care of the planet, by giving them an astronaut's-eye view of Earth as a small and fragile outpost of life hanging alone in the blackness of space. One of the Urthecast HD cameras— which together cost about $17 million — will take pictures with a resolution of 16.5 feet (5 meters), while the other will record color video that can capture details as small as 3 feet (1 m) across, Larson said. The company plans to stream about 150 videos per day in near real-time from this latter camera, each of them lasting about 90 seconds. Urthecast aims to turn a profit in several different ways. It will sell its footage to government agencies and non-profit organizations interested in tracking such things as natural-resource use and animal migrations, for example, as well as private companies keen to keep an eye on their operations and those of the competition. "We're getting calls from everybody — large mining companies who want pictures of their mining operations every six weeks to see who's putting in roads and kind of scratching around them; oil and gas companies, to see who's putting in oil and gas rigs next to them," Larson said. But Urthecast also aims to capitalize on an expected flood of visitors to its website. "We think that, if we can get this stuff out online in as near real-time as we can, everybody in the world's going to want to come to the website once," Larson said. "Then of course, we need to build some value around there and add some other utility, and hopefully make it part of people's everday lives." If that happens, the planet and its many diverse ecosystems could benefit, he added, noting that astronauts tend to say that seeing from Earth from space is a life- and perspective-changing experience. "They all come back with a greater appreciation of our need to take care of the planet," he said. "There's an educational and environmental, a planet-stewardship, aspect to what we're doing here." 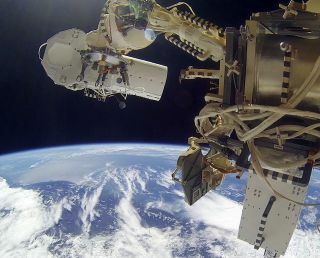 Monday's spacewalk was the second attempt to install the Urthecast cameras, following a December effort that was aborted due to connectivity problems with the instruments. While both cameras are now attached, there are some telemetry issues with the 16.5-foot-resolution camera, NASA officials said on Monday. Larson accentuated the positive and declined to discuss any possible glitches in detail. "Both cameras were successfully installed," he said, adding that the company has received data back from both instruments. "Now we need to calibrate and commission and continue to focus both cameras, including the medium-resolution camera. That's where we are." Commissioning will likely take about three months, Larson said. The first images should start coming down in four or five weeks, and the cameras should become fully operational in April or May, he added.